A little about 12 kms from Assolna as we hit the Canacona highway we come across another small hamlet of Korpem village. Just besides the highway we meet Yogesha Gaonkar struggling to setup her small stall, selling jackfruits, mangoes and garlands along the highway. Neither has the panchayat built a nice sopo for womenfolk like Yogesha to sit and sell her fruits, nor has she received any help as she carries the fruits out of the forest to sell along the highway. “My children are like the children of today, who go to a government primary school and crouch in a room with few others and are taught class one to class four in the same room, they then moved to a high school learnt some more and finally dropped out post class 10 because of a lack of opportunities and politicians want bribes at government jobs. In turn my children are not trained to lift fruit baskets and I am left alone to do this and fund my family as my husband died young of kidney failure. 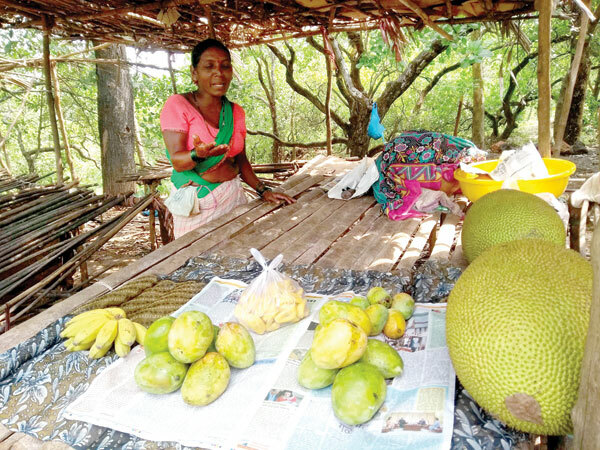 Similarly Sanyi Gaonkar from Korpem village comes to the highway to sell jackfruits and mangoes from their village located in the hinterland and similarly says her daughters refuse to help her in her business. She also brings some palm leaves she picked up in the morning to weave together a stick broom hoping to sell it at the highway. “We had some traditional skills of making choir, broomsticks and many more items. Our children work in foundries at Cuncolim industrial estate or my daughter as a domestic help in Navelim. They’re forced to go so far as there is no employment in our village. Also there are no roads to our village and hence the youth find it hard to come by. We struggle between cultivation and raising our families financially,” stated Sanyi. Devi Velip walks out of her village to go to far off Cuncolim in search of daily wage work but she explains the surprise since most of the youth in her hamlet prefer to stay unemployed at home instead of working like her and earning something. She blames the government schemes that give out dole. While a young Vijesh Velip along with his two sons searching in the wild for fallen cashew seeds to make a quick buck. They roam with a tin bucket and a stick scourging for the few left cashews before monsoons. “There was defense expo in Balli and we hoped to get some jobs but they brought labour from outside Goa. Now this massive Rs 89 crores worth rail freight corridor got setup at Balli taking away our forest land, cutting through our fields and destroying our fields with mud and sludge last monsoons from the rain water flowing out of the cut hills,” stated Vijesh. Vijesh tells us that he hoped to get a job at the freight corridor works but the gangs of workers and masons used at the construction site are all non-Goan and in fact all the contractors itself are not from Goa and he feels betrayed how his fellow men are taken from granted and not provided any job opportunities by the central government modal agency. “In a scenario like this I too will not send my kids to school and I will teach them life skills at home. No use sending my boys to school and then suffering from a no jobs scenario stated Vijesh while his boys in their adolescence are busy collecting cashews. He blames not just joblessness but lack of quality education too.